I'm wondering if there's going to be some work done to cover the concept of a Pony Cavalier, since they have no need for an actual Mount. Maybe a Class ability that lets them ignore the -2 penalty for using Saddle Racks with Slashing and Bludgeoning weapons? On a related note, I think forcing Ponies to wield Shields with their mouths is rather silly, since the Campaign book clearly shows a Pony fighter with a Shield strapped to his foreleg. Re: Pony Cavaliers, and Shields. Just so I can get a quick peek, page #? Really hope so as well. one of the things I was legitimately disappointed not to see in the book was something addressing pony Cavaliers. Though what -2? I don't see that anywhere in the saddle racks description, but do see they added that anything in it functions as if you were mounted while charging, so that clears up one of the biggest issues. Personal idea, and houserule I'm considering should my game have a cavalier show up. is instead of a mount, pony cavaliers can bond with one of their companions. When this companion is riding you. (Requires sizes to be compatible for this) he gains the use of any of your cavalier, mount based class abilities. As you both share any mounted feats either of you have. While without a rider, the Cavalier can consider themselves as being mounted for the purpose of any mounted combat feat that does not require the rider and mount to be separate entities to work. So can use Ride-By-Attack, or Trample, but not the basic mounted Combat bonus. As to shields, yeah that is odd. And it's page 103. under the Ponies as Fighters entry for the class pages. That's a unicorn. The shield is floating. Oh, sorry, the Saddle Rack penalties were in the Race Book files, but not in the Campaign Setting file. Never mind that, then. That still leaves us with Pony Cavaliers having no valid alternative to the Mount ability, save for the very silly image of Ponies riding Other Ponies. And I still think mouth-held shields is silly, since it means nobody but a Unicorn can wield a sword and shield combo. A pony would not ride a pony. A pony could ride a full sized horse, however, or other exotic creatures. 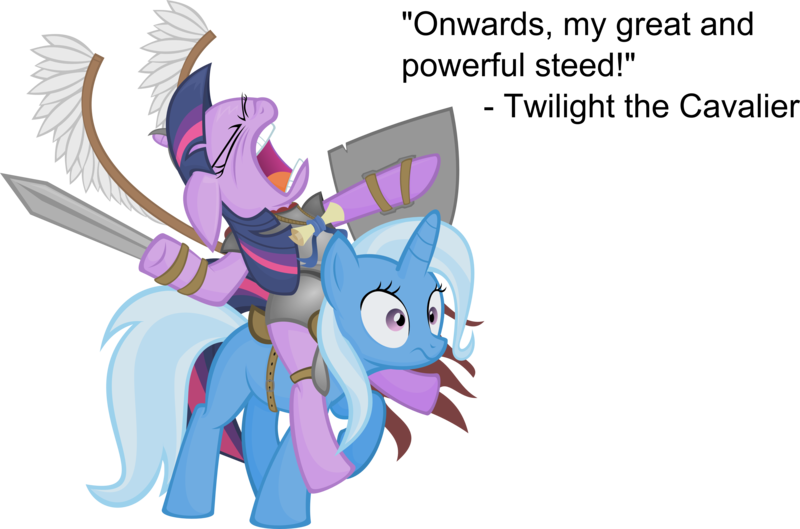 A pony riding a gorilla would be an amusing turning of the tables as equines ride humanoids into battle. That's what house rules are for. Though, still hope to see something official for Cavaliers. I've been going through my books, looking for viable options to replace the Mount. Best I could find is giving the Cavalier Improved Overrun Attack as a Bonus Feat at level 1 to replace Mount, then alter the Cavalier's Charge chain of Class Abilities to apply to ordinary Charges rather then Mounted Charges. Pony Cavaliers don't need Mounts to make a cavalry charge. Maybe call this Cavalier Archetype the Destrier? Edit: Actually, found an alternate bonus feat concept from the Pathfinder OGC: Stable Gallop. Just need to adapt the Feat to apply to the Pony Cavalier's own AC when charging. How could a non-unicorn pony wield a sword, or anything really, while holding a mouth sheild? And how could it move well if the sheild is larger than a buckler? Could they strap a sheild to the saddle rack? Or strap it to a foreleg? By putting the sword, spear, lance, or what not into their saddle rack before wielding the shield. The real question is how to switch things up in the middle of combat. Short Answer: Awkwardly. Strapping it to your saddle rack could maybe work? If your GM is alright with you doing that, I won't think poorly of you. If you're going to allow a saddle rack to hold two weapons or a weapon and a shield at once, however, I would suggest removing the option to wield weapons or shields in the mouth, since you have basically negated the need for it.